This must-have, powerful HBO miniseries takes you into the hellish heart of war like nothing else, following the men of Easy Company of the 101st Airborne as they take part in some of the most difficult battles of the European war. CBI - China: Day 138 of 154 of the Japanese Invasion of Manchuria. CBI - China: Day 8 of 10 of the Battle of Harbin, Manchuria. CBI - China: Day 6 of 41 of the 1st Battle of Shanghai. CBI - China: Day 33 of 142 of the 1st Battle of Hebei. Spain: Day 201 of 985 of the Spanish Civil War. Spain: Day 566 of 985 of the Spanish Civil War. CBI - China: Day 211 of 2,987 of the 2nd Sino-Japanese War. Spain: Day 931 of 985 of the Spanish Civil War. CBI - China: Day 576 of 2,987 of the 2nd Sino-Japanese War. Finland: Day 65 of 105 of the Russo-Finnish War. In southern Finland, the Soviets make a large attack against the Finns at Summa. CBI - China: Day 941 of 2,987 of the 2nd Sino-Japanese War. Day 80 of 381 of the Battle of South Guangxi. Day 6 of 67 of the Battle of Wuyuan. MTO - North Africa: Day 56 of 63 of the UK's Operation COMPASS, their campaign in North Africa against the Italians in Egypt and Libya. ETO - UK: Day 150 of 258 of the Blitz. 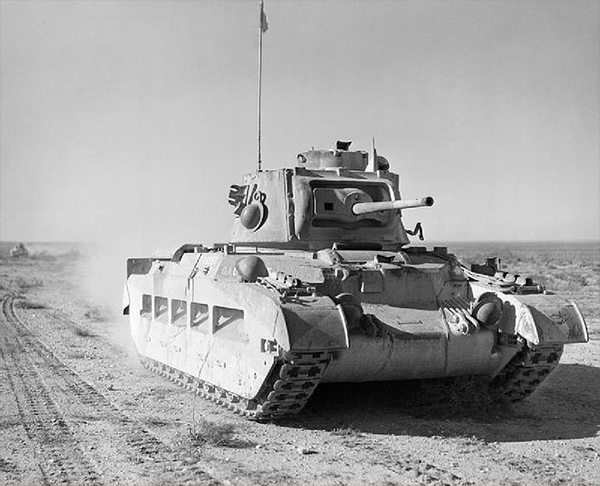 East Africa: Day 238 of 537 of Italy's East African campaign in the lands south of Egypt. 5th Indian Division captures Barentu, Eritrea, forcing the Italians to withdraw toward the mountain fortress at Keren. CBI - China: Day 1,307 of 2,987 of the 2nd Sino-Japanese War. Day 4 of 31 of the Battle of South Henan. CBI - Thailand: Day 125 of 221 of the Franco-Thai War (Vichy France vs Thailand). USA: Congress appropriates $26.5 billion for the US Navy, bringing total US war costs since June of 1940 to more than $115 billion. Atlantic: Day 20 of 169 of Germany's Second "Happy Time," during which U-boats sink 609 Allied ships with little risk. Russian Front - North: Day 148 of 872 of the Siege of Leningrad. Russian Front - North: Day 25 of 29 of the Battle of Toropets, Russia. A failed attempt to break the siege at Leningrad. Russian Front - North: Day 11 of 103 of the Battle of the Kholm Pocket. Another attempt to break the siege at Leningrad. Russian Front - Center: Day 26 of 103 of the Battle of Vyazma, Russia. Russian Front - Center: Day 26 of 103 of the Battle of Sychevsk, Russia. Russian Front - South: Day 96 of 248 of the Siege of Sevastopol, Crimean Peninsula. All German attacks against Sevastopol are stopped for the winter. MTO: A supply convoy bound for Malta sets sail from Alexandria. However, the Luftwaffe still manages to sink all three merchantmen before they reach Malta. CBI - Burma: Day 51 of 164 of Japan's Invasion of Burma. CBI - China: Day 1,672 of 2,987 of the 2nd Sino-Japanese War. Day 41 of 99 of the 3rd Battle of Changsha. CBI - Java: Day 4 of 17 of the Battle of Singapore. The Japanese siege of British troops in Singapore continues. PTO - Borneo: Day 49 of 107 of the Battle of Borneo. PTO - Dutch East Indies: Day 4 of 5 of the Battle of Ambon. Japanese troops invade Java. PTO - New Guinea: Day 11 of 18 of the Battle of Rabaul, New Britain Island. PTO - Philippines: Day 57 of 152 of the 1st Battle of the Philippines. 5th Air Force provides air support. ETO - UK: US 8th Air Force: Flying Spitfires, the 4th Fighter Group flies defensive and fighter patrols over the Channel. Russian Front - North: Day 513 of 872 of the Siege of Leningrad. Russian Front - North: Day 274 of 658 of the Siege of the Kholm Pocket, USSR lays siege to the Kholm Pocket but the Germans hold out for a about a year and a half. Russian Front - South: Day 165 of 165 of the Battle of Stalingrad, bloodiest battle in human history. 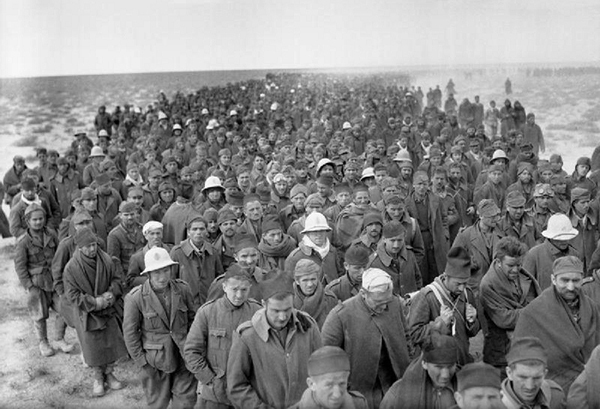 German troops surrender at Stalingrad in the first big defeat of Hitler's armies. Russian Front - South: Day 53 of 69 of the USSR's Operation LITTLE SATURN. A successful drive into the Northern Caucasus and the Donets Basin pushing the Axis troops out. MTO - Tunisia: Day 78 of 178 of the Battle of Tunisia. RAF and US Air Forces provide Allied air support. CBI - Burma: Day 44 of 104 of the 1st Battle of Arakan. US 10th Air Force provides air support. CBI - China: Day 2,037 of 2,987 of the 2nd Sino-Japanese War. PTO - Alaska: Day 241 of 435 of the Battle of Kiska, Aleutian Islands. PTO - Malaya: Day 349 of 357 of the Battle of Timor Island, a long guerrilla war ending in Japanese victory. Allies continue evacuating off the island. PTO - Solomon Islands: Day 180 of 187 of the Battle of Guadalcanal. US 13th Air Force provides air support. Twenty Japanese destroyers begin evacuating 13,000 troops. 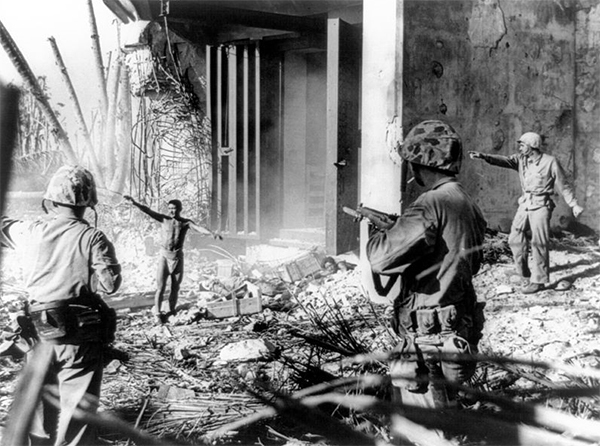 PTO - Marshall Islands: Day 3 of 8 of the Battle of Kwajalein. US Marines complete the capture of Roi and Namur in the strategic Kwajalein Atoll, a major step in the Pacific offensive. The relatively easy capture of Kwajalein demonstrated US amphibious capabilities and showed that the changes to training and tactics after the bloody battle of Tarawa had been effective. It allowed Nimitz to speed up operations in the Marshalls and invade Eniwetok Atoll on 18 February 1944. The Japanese learned from the battle that beachline defenses were too vulnerable to bombardment by ships and planes. In the campaign for the Mariana Islands, the defense in depth on Guam and Peleliu was much harder to overcome than the thin line on Kwajalein. USA: Stalin agrees to provide six bases for US aircraft inside the USSR. ETO - France: US 8th Air Force B-24s hit V-weapon construction sites at St Pol/Siracourt and Watten. ETO - France: US 9th Air Force B-26s attack the Triqueville Airfield. Russian Front - North: Day 639 of 658 of the Siege of the Kholm Pocket. USSR lays siege to the Kholm Pocket but the Germans hold out for a about a year and a half. Russian Front - North: Day 20 of 48 of the Battle toward the Narva River, Estonia. This drive helped lift the Leningrad siege and goes on to liberate Narva. Russian Front - North: Day 1 of 191 of the Battle of the Narva Isthmus, Estonia. Russian Front - North: Day 20 of 33 of the Battle of Luga, Russia. Taking this town west of Leningrad will open the door toward Estonia. Russian Front - South: Day 41 of 113 of the USSR's Dnieper-Carpathian Offensive in southwestern Ukraine. Russian Front - South: Day 4 of 31 of the Battle of Nikopol, Ukraine. Russian Front - South: Day 10 of 25 of the Battle of the Korsun Bulge in Ukraine. Russian Front - South: Day 7 of 16 of the Battles of Rovno and Lutsk, Ukraine. This Soviet victory will increase the gap in the German line from 70 to 110 miles wide. MTO - Albania: US 15th Air Force B-24s bomb the radar station at Durazzo. MTO - Italy: Day 17 of 123 of the Battle of Monte Cassino. RAF and US Air Forces provides air support for the Allied ground troops. MTO - Italy: Day 12 of 136 of the Battle of Anzio. RAF and US Air Forces provides air support for the Allied ground troops. CBI - Burma: Day 35 of 99 of the 2nd Battle of Arakan. CBI - China: Day 2,402 of 2,987 of the 2nd Sino-Japanese War. PTO - New Guinea: Day 137 of 219 of the Battle of Shaggy Ridge. 5th Air Force provides air support. PTO - New Guinea: Day 134 of 162 of the Battle of the Huon Peninsula. 5th Air Force provides air support. PTO - New Guinea: Day 50 of 597 of the Battle of New Britain. US 13th Air Force provides air support. PTO - Solomon Islands: Day 94 of 295 of the Battle of the Bougainville Islands. US 13th Air Force provides air support. South America: Ecuador declares war on Germany. ETO - France: Day 186 of 284 of the Battle of Brittany. ETO - France: Day 141 of 236 of the Siege of Dunkirk. ETO - Germany: Day 137 of 145 of the Battle of Hürtgen Forest. ETO: Day 14 of 66 of the Battle to the Rhine. French troops occupy Colmar. US 9th Air Force provides air support. Russian Front - Finland: Day 141 of 223 of the Lapland War. Finland and Russia have joined forces to kick the Germans out of Finland's most northern province. Russian Front - Center: Day 111 of 206 of the Battle of the Courland Pocket in Latvia. Russian Front - Center: Day 9 of 75 of the Battle of Königsberg, East Prussia (now Kaliningrad, Russia). Russian Front - Center: Day 7 of 17 of the Battle of Rastenburg, East Prussia. Russian Front - Center: Day 8 of 63 of the Battle of the Heiligenbeil Pocket in East Prussia. Russian Front - Center: Day 22 of 23 of the Battle along the Vistula and Oder Rivers in central Poland and eastern Germany. Soviet units reach the Oder to the south of Frankfurt, Germany. Russian Front - Center: Day 2 of 31 of the Battle of Schwedt, Germany. Russian Front - Center: Day 20 of 21 of the Battle of Warsaw, Poland. Russian Front - South: Day 97 of 108 of the Battle of Budapest, Hungary. Soviet troops have Budapest under siege. MTO - Yugoslavia: US 15th Air Force attacks the Kurilovec Airfield. CBI - Burma: Day 15 of 61 of the Battles of Meiktila and Mandalay. The US 10th Air Force provides air support. CBI - Burma: Day 13 of 39 of the Battle of Ramree Island. The US 10th Air Force provides air support. CBI - China: Day 2,768 of 2,987 of the 2nd Sino-Japanese War. US 14th Air Force attacks at Lungchow. PTO - Formosa: US 5th Air Force B-24s hit the Okayama Airfield during an early dawn raid. PTO - Japan: US 7th Air Force bombs the two airfields on Iwo Jima. PTO - New Guinea: Day 403 of 597 of the Battle of New Britain. PTO - New Guinea: Day 287 of 481 of the Battle of Western New Guinea. PTO - Philippines: Day 106 of 299 of the 2nd Battle of the Philippines, aka the Liberation of the Philippines or the Philippines Campaign. PTO - Philippines: Day 50 of 244 of the Battle of Luzon. 5th Air Force provides air support. PTO - Philippines: Day 3 of 22 of the Battle of the Bataan Peninsula. 5th Air Force provides air support. The air war between the British, French and Italians over North Africa in 1940-41 was the last major combat in which both sides flew fighter bi-planes. A uniquely written account of a WWII battle when a platoon of soldiers was interviewed as a group just fresh from the front lines of the Battle of Kwajalein.